Averi’s last day of school was on Thursday. Since we have a lot planned for the summer we wasted no time on taking our first summer trip. 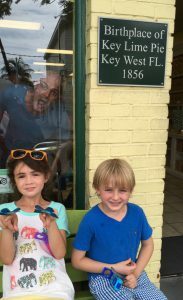 We actually took Averi out of school an hour early so that we could begin the drive to the Keys, with some friends. The Keys are a collection of islands that start with Key Largo and end with Key West. Key Largo is 68 miles away and Key West is 164 miles. 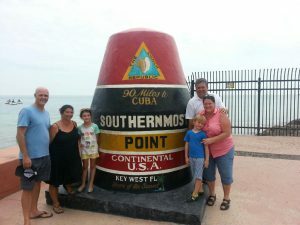 We decided to start our trip in Key West, and stop at other islands on our way back. Now, under normal freeway driving circumstances (i.e., 80 mph) the drive should take around two hours to get to Key West. However, the drive is either a one lane freeway where you can easily get stuck behind a RV, a truck towing a boat, or just a bad driver. When the drive is two lanes it is because you are in one of the Key towns, and have to go slow. So you pretty much never get over 40 mph. Hence, a 3 1/2 hour drive from Miami to Key West. We heard the best story about the drive while on the Hop On Hop Off Trolley Tour. Back in 1982 the government decided that they were going to set up an inspection point to check EVERY. SINGLE. CAR that drove to the Keys. They were looking for drugs and illegal immigrants. It made the drive last anywhere from 12 to 16 hours. 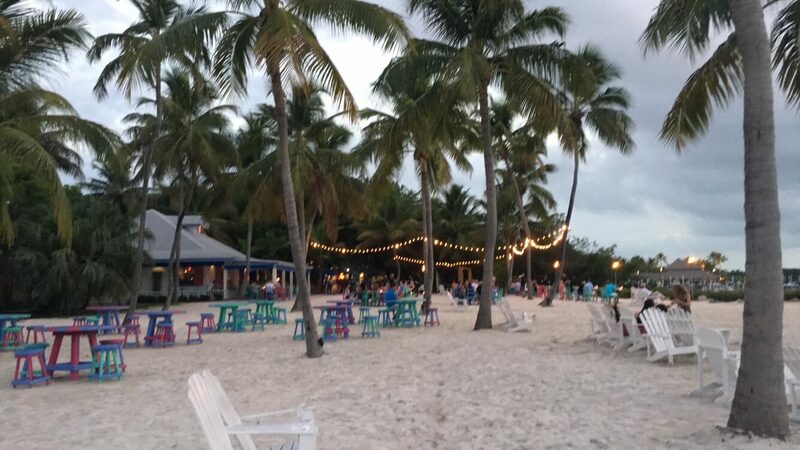 Obviously people stopped going to the Keys for fun weekend getaways. The tourism industry took a massive dive. The government of the Keys kept complaining to the Federal Government, but they got no results. So in April of 1982 the Mayor of Key West stated that since the U. S. basically set up a border inspection station and was treating the Keys like a foreign nation, then they would be a foreign nation. The Keys declared independence and called themselves the Conch Republic. The first act the Conch Republic did was to declare war against the US. However, as they had no army (and no interest in actually being in a war), they immediately surrendered. And then applied for ONE BILLION dollars in foreign aid. Ha! I love it. They of course did not get any of the aid, but they did get a ton of publicity. Which then caused the Federal Government to finally back down and remove the inspection point. 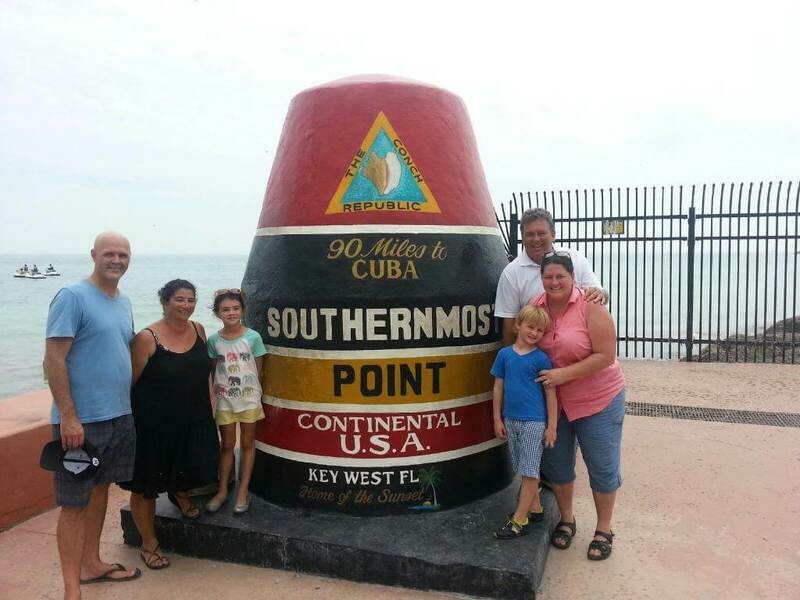 The Keys rejoined the US, but they still enjoy the story. And sharing it with others. Like through this fun bag I got as gift with purchase from Key West Aloe. 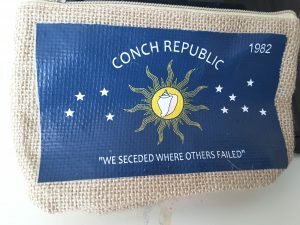 That is the flag they created for the Conch Republic. We went a little crazy in Key West Aloe (hence my gift with purchase 🙂 ). And with Key Lime purchases in general. 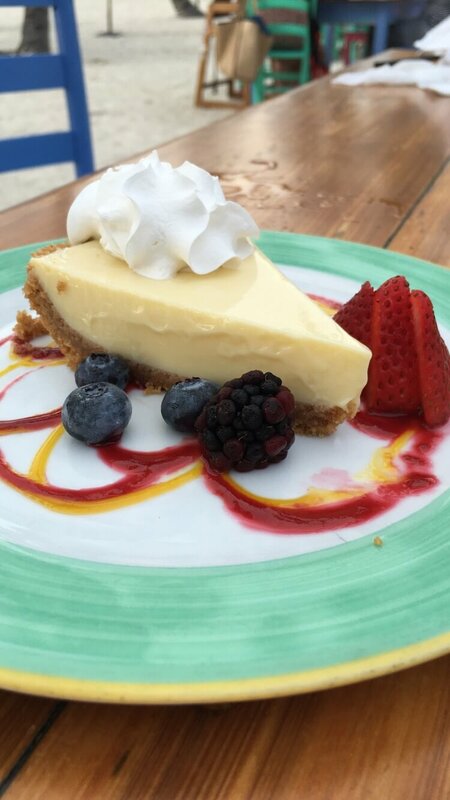 Key Lime trees are natural to the Keys, and Key Lime Pie was created there. As part of the tourism industry they have embraced all thing Key Lime. And I bless them for that. 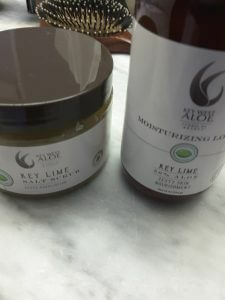 We bought key lime salt scrub and moisturizer in Key West Aloe. 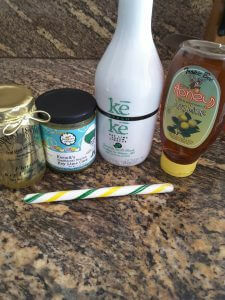 We also bought Key Lime Liquor, Key Lime Curd, Key Lime candy, and Key Lime products as gifts. Plus we ate Key Lime Pie every day. We had it the first night with a marshmallow topping. And we had it the last night at this gorgeous restaurant right on the beach. The best key lime, though, was the chocolate covered key lime pie on a stick. OMG. So good. 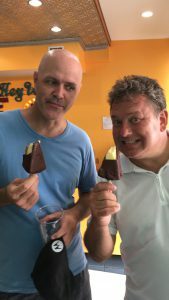 The day we ate the chocolate covered key lime we went to dinner at The Conch Republic Seafood. After the key lime pie we weren’t very hungry, but it was right on the water, with some good live music so we went on in. Michael just ordered a cup of the conch soup and the Boursin Stuffed Mushroom appetizers. The mushrooms were heaven. 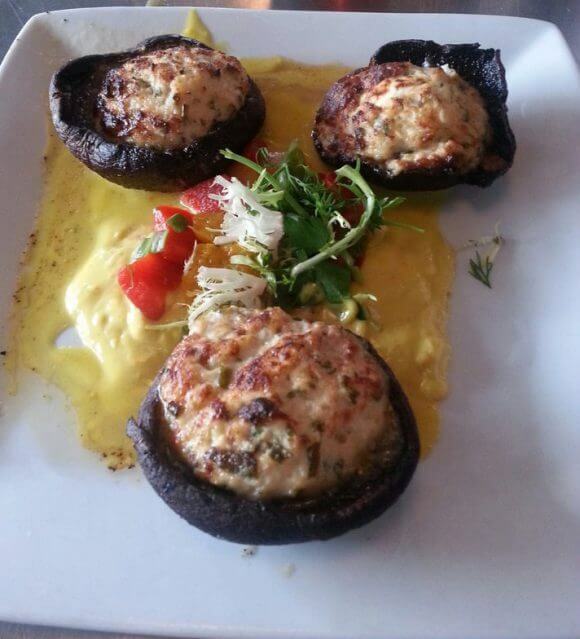 Big meaty portabella mushrooms filled with a boursin mixture. 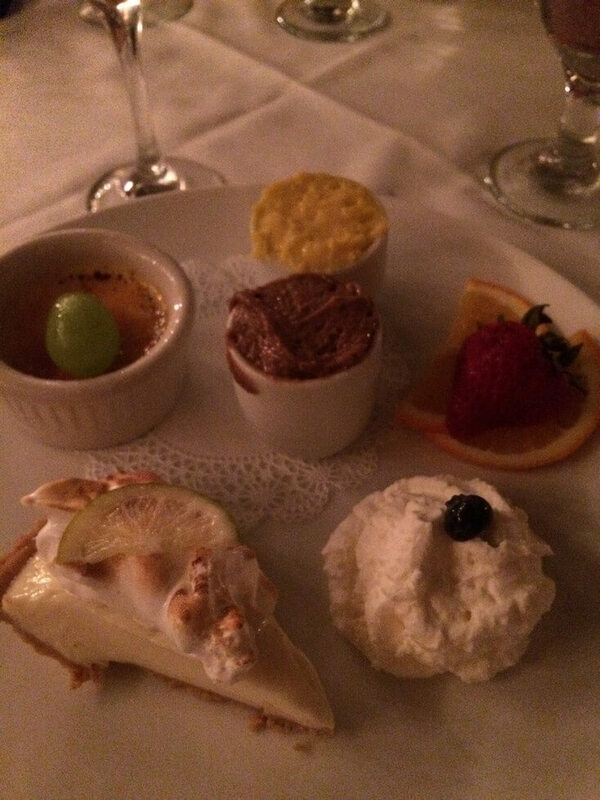 Even without being hungry we inhaled them. I will definitely be making them myself, at some point in the future. And while I don’t have their recipe, I found this recipe on The Taste Place. I found a few recipes, but I like this one best, as she uses portabella mushrooms and adds some great ingredients to enhance the Boursin. If you try this recipe before I do let me know what you think!